Bake the butternut squash at 210°C until al dente (or as soft as you would like it). When cooked, scoop out the flesh using criss cross cuts which don't go right the way through the skin (much as you would with a mango). Bring a saucepan of water to the boil and add the prawns. Cook for 2-3 minutes until the turn pink. Do not overcook or they will be tough. Drain, retaining the liquid, and plunge immediately into a bowl of iced water to arrest the cooking process. When cool enough to handle, peel the prawns. Sautée the garlic and ginger in a little Fry Light until it is just beginning to go brown, then add the tomato purée and paprika plus a little of the cooking water from the prawns. 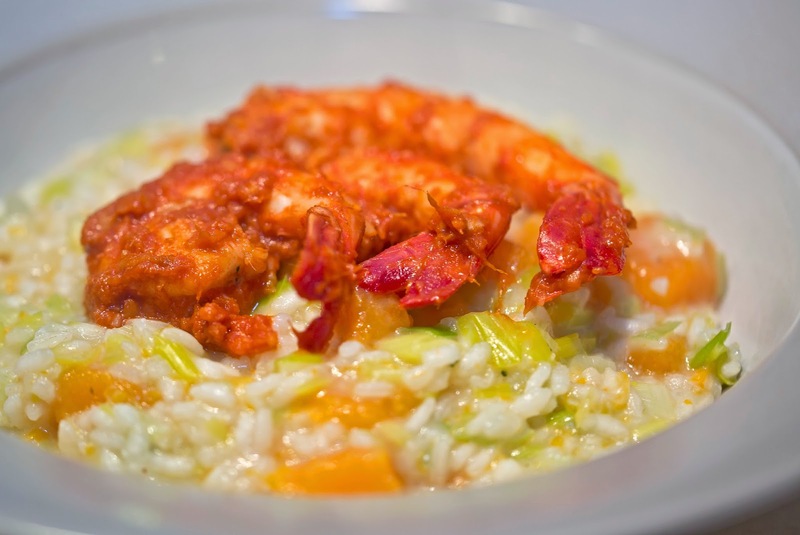 Just before the risotto is ready, add the prawns to the sauce – either whole or sliced – to reheat. Place the rice in a saucepan with some of the cooking liquid from the prawns, bring to the boil and stir continuously while the rice absorbs the liquid. Continue adding about a ladle-ful of water each time, adding the wine and bouillon powder at some stage. About half way through (the whole process usually takes 20-30 minutes), add the leeks. When the rice is cooked to your liking, add the butternut squash and stir until the squash it heated through. Take the risotto off the heat and stir in the cheese. Serve with the prawns on top.